Well, the wait is finally over. 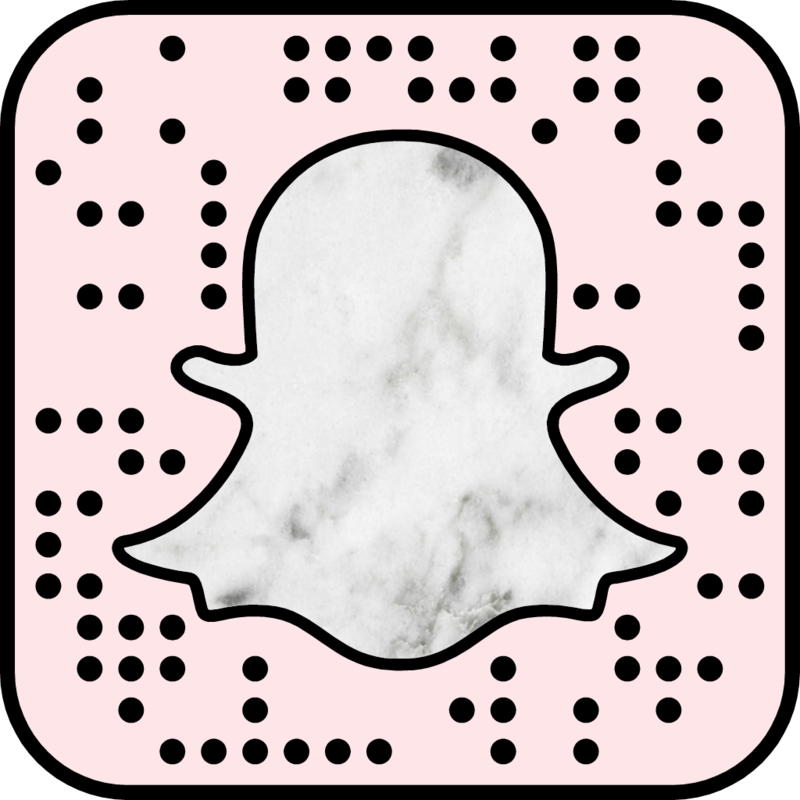 I have so much to report about my trip to Cabo San Lucas, and I just cannot wait to share! First of all, let’s start with a little background on this vacay. 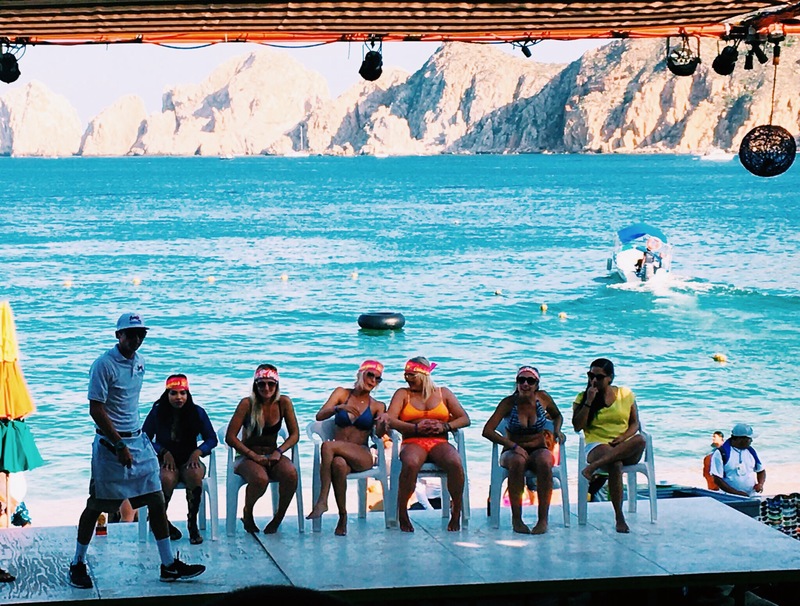 So, as I mentioned in my Cabo Caravan teaser post way-back-when, I was going to be traveling with just under 30 of my good friends (25 was the official count), which I personally thought would be just short of impossible to orchestrate. However, this trip ended up being one of the most organized, good fortuned, and all-around amazing vacations I have ever taken. 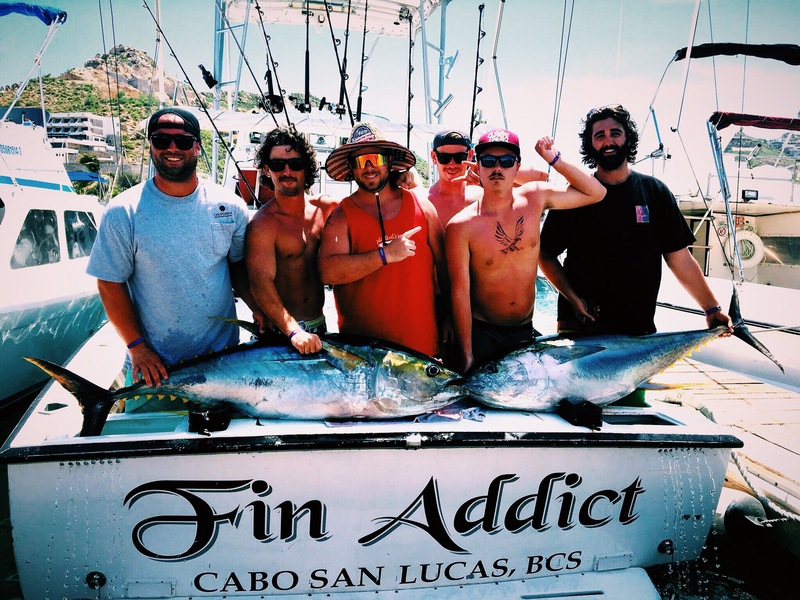 Back in April, Austin was approached by a few of his close friends who asked if he was interested in heading down to Cabo with a group of them in August. They explained that it was an all-inclusive trip booked through Costco Vacations, which included round-trip airfare, shuttle service to and from the airport, all-you-can-eat (and drink, of course) meals throughout the resort (AND the sister resorts), and even came with spa credit. 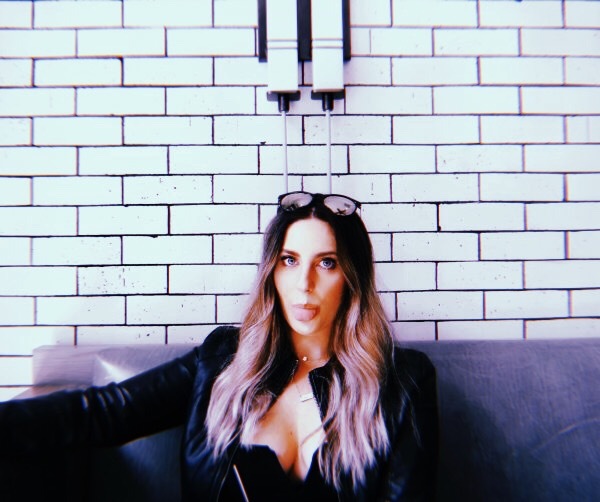 The only kicker – in order to get the most bang for your buck, you needed four people per room, which essentially meant that little ole me had to be onboard to go play with the gang South of the boarder. Well, me being me, I obviously had a few reservations about the trip at first. Now, I know what you’re thinking, how could I possibly have reservations? 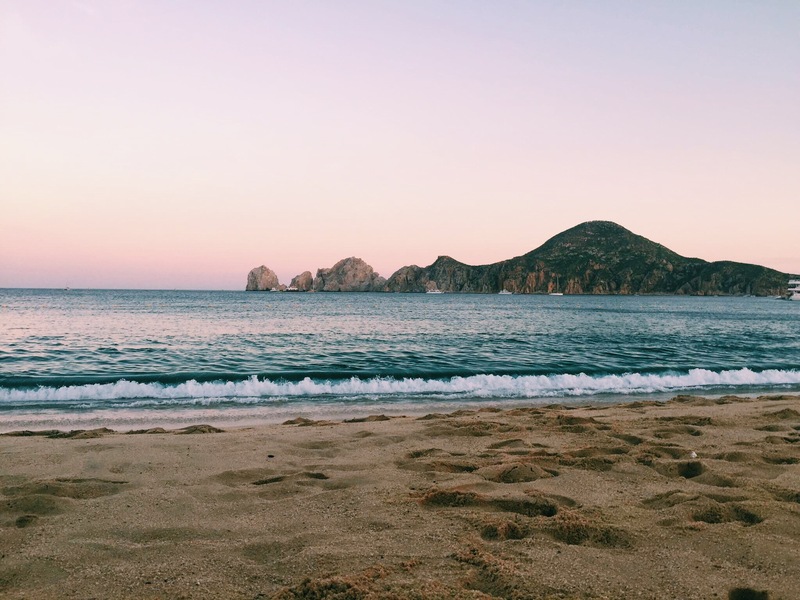 An all-inclusive trip to Cabo with my boyfriend and friends? That’s a no-brainer! I know, I know, call me crazy, but I just did. HOWEVER, once I got over myself, adjusted my budget/work schedule, and realized how exciting this vacation was going to be, I was all in. Then, sure enough, after we booked the trip and everyone going began spreading the word about the great deal we were getting to a few other friends, they wanted to join in on the experience as well. 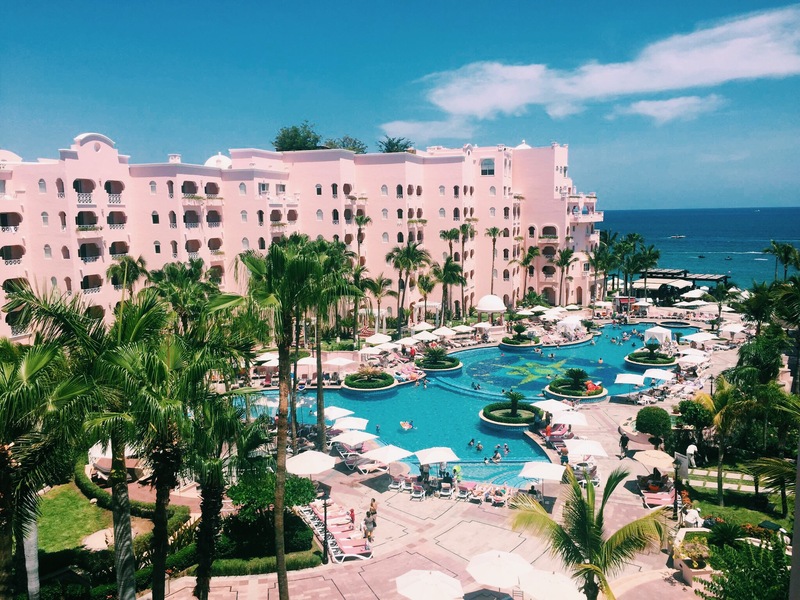 Before we knew it, 26 of us had signed up to rally for four days and three nights at the beautiful Pueblo Bonito Rosé resort. We started this wild ride of a vacation off by literally taking one hell of a wild ride to LAX from the OC . With fresh Dunkin Donuts®, champagne, and coffee & Bailey’s® in hand, we packed twenty-five twenty-something-year-olds dressed in Cha-Cha dancer bikini shirts and tacky tourist outfits (yep, that’s real life) into a party bus at 5 AM. Here’s a little visual of how we looked Wednesday morning in case you didn’t believe me. I’m pretty sure everyone in the airport thought we were out of our minds, but, I mean, when in Rome (or, in this case, when in Mexico)! Needless to say, we were fired up and ready to get this fiesta started. While we may have been the biggest eyesores this side of the Pacific, I am also convinced we were the luckiest. To start, we absolutely flew through traffic (on a Wednesday morning) to the airport, all of us outrageously dressed goons made it in and out of security in a flash, and our flight was easy-peasy. Not to mention, our luggage made it safe and sound to Mexico (I’m definitely not, and will never be, a carry-on type of girl, so this was a serious bonus in my eyes). Once we landed, we cruised through customs, grabbed ourselves a cerveza, and cut a solid twenty minutes off of our drive time to the resort after our driver briliantly suggested we take the toll road. But, our luck didn’t even begin to stop there. The weather in Cabo had been absolutely terrible just days before we left, but magically turned itself around, giving us the most perfect forecast we could have ever hoped for until the moment we left. And, as if that wasn’t enough, when we finally arrived to the resort, we were upgraded to a two-story penthouse suite sitting atop the center of the property (complete with sleeping for ten, four bathrooms, a kitchen, dining room, living room, three balconies, its own private pool, Jacuzzi, and the most gorgeous view). Yes, this is an actual picture taken on my camera from the rooftop balcony at the penthouse. Holy crap, right? Plus, even those who didn’t get to sleep in the penthouse were able to get their rooms upgraded too! I am honestly not sure how we scored this much, but I’m thinking the twenty-five of us need to make our next destination Vegas so we can see just how lucky we really are. Clearly, we were all on cloud nine at this point, and decided to kick-off the trip by spending the rest of the day celebrating our insanely good fortune. If you’re looking to have an absolute blast, I highly suggest Mango Deck. This popular restaurant/sports bar/club located on Médano Beach is the place to go for live music, hilarious contests, and getting awkwardly smacked on the head & felt-up by waitresses blowing whistles while simultaneously pouring mango flavored shots down your throat (if you’ve been there, you know exactly what I’m talking about, if not, I’ll let you put those pieces together when you venture there yourself). Four girls from our group (the four in the middle) getting ready to compete in a contest at Mango Deck. Mini visual of the crazy shot girls with whistles at Mango Deck. This bar was awesome and is a total Cabo must. Situated in the heart of downtown, all three stories of this funhouse-esque restaurant turned dance club go off after dark and you can totally get your groove (or grind) on. Our group definitely frequented this spot above all else. 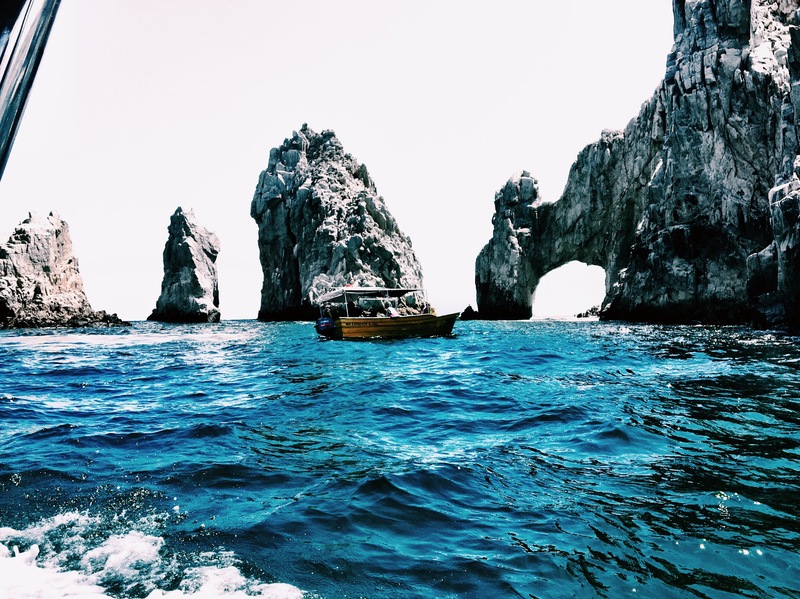 We took a glass-bottom boat tour to the Arch of Cabo San Lucas and Lover’s Beach, made one more quick stop at Mango Deck, and ended the night back at our resort. Close-up of the Arch of Cabo San Lucas from our glass-bottom boat tour on Day 2. All of the ladies at Lovers Beach on Day 2. We decided to keep things a bit more low-key for Day 2 since six of our boys were getting up at the crack of dawn to go fishing the following day, which actually proved to be another lucky charm. Like I said, this trip couldn’t have been anymore fortunate for us. While our fishermen were off at sea, the rest of us proceeded to utilize our amazing pool, and, obviously, take advantage of the all-inclusive food and drink service. The Pueblo Bonito Rosé pool. Let me just say, thank goodness for all-inclusive vacations because we would have really racked up quite the tab otherwise. After a day of lounging in the sun, water aerobics (I can’t even begin to explain that one), and mas tequila, our boys came back from their fishing excursion with a 123 lb. Yellowfin Tuna (caught by my boo thang himself) that the resort would later grill, slice into sashimi, and roll into sushi for a huge family-style sunset dinner overlooking the beach. Our six badass fishermen & their awesome catches. 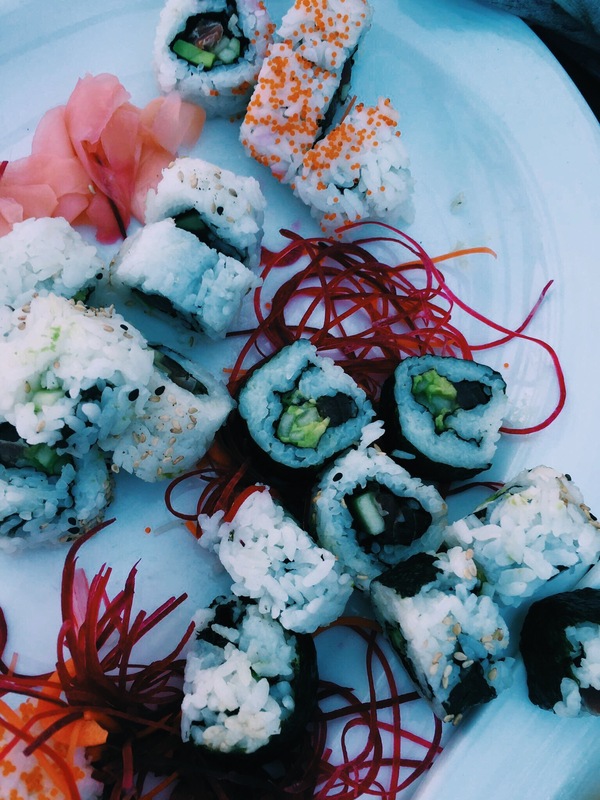 Just some of the incredible sushi from the family-style fish dinner we ate on Day 3. Honestly, this day topped the charts, and we did not want the good times to end. So, we decided to keep the energy level up and end the night dressed in our best at none other than the infamous Cabo Wabo Cantina. If you haven’t heard of Cabo Wabo, you must have been living under a rock for the past 26 years because this timeless attraction, founded by rock legend Sammy Hagar, is one of the most well-known places to party, not only in Mexico, but all over the world, which made kicking off our last night in Cabo there yet another no-brainer. After getting our fix of live 80’s Rock covers, we ended the night once again at El Squid Roe. When the final morning of our trip rolled around, we decided to forego our all-inclusive buffet breakfast and took a stroll down the beach to The Office.  Oh my gosh, you guys, this place is another must. 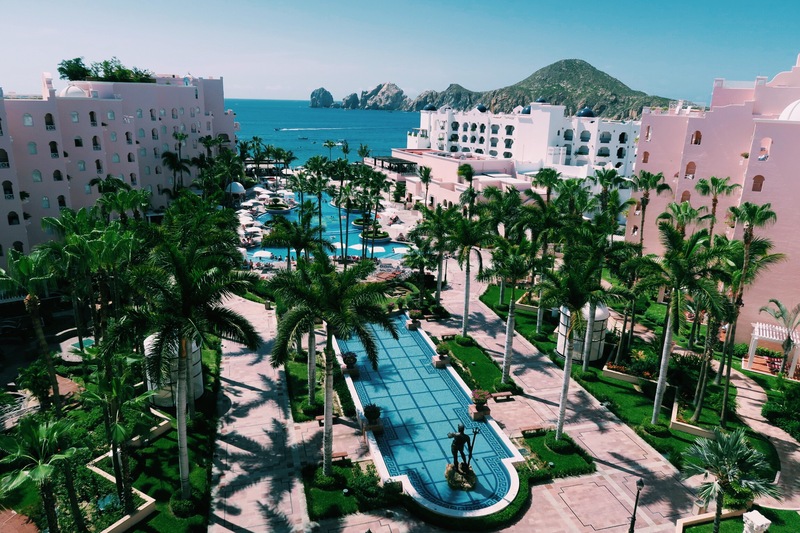 A Cabo San Lucas favorite since the 1970s, The Office also sits on Médano Beach (right next to Mango Deck) and is the perfect spot to enjoy a meal with your toes in the sand, waves crashing in the background, and traditional tableside mariachi music. My breakfast, which I consider more of a brunch, consisted of chips and salsa (naturally), three mini chicken enchiladas, and cheesy breakfast potatoes. If you hadn’t already noticed, my motto for this trip was simply, “indulge”. Nevertheless, it was a great way to end our vacay, and I am so glad we strayed from the resort and stumbled into the vibrant beachside dining experience that is The Office. Such a cool spot with killer food. Our last sunset in Cabo. Sadly, that was the last stop of our adventure, and, before we knew it, we had said adiós to Cabo, and found ourselves standing curbside at LAX, baggage in hand, wondering how months of prepping, planning, shopping, and anticipating flew by in the blink of an eye. 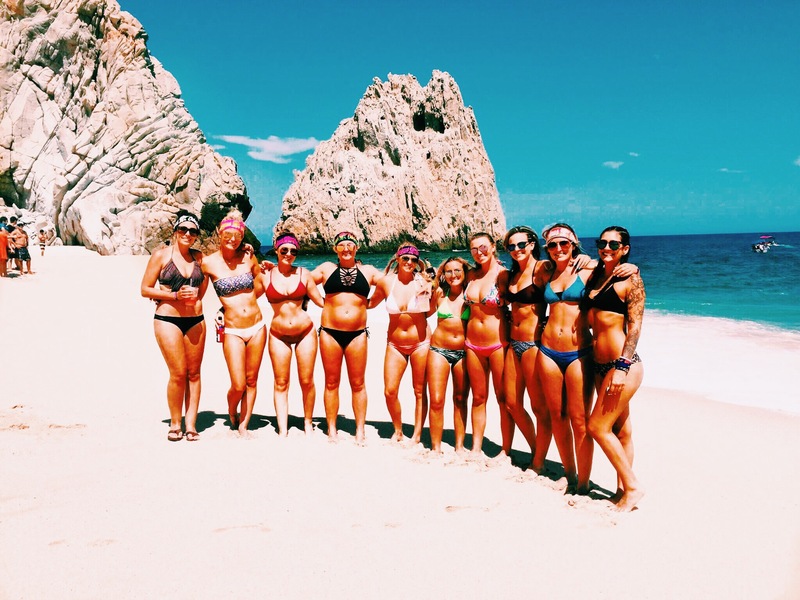 Regardless of the turn-around time, this was a vacation for the record books, and all twenty-five members of our Cabo caravan are currently brainstorming where to venture off to next. Any suggestions? Let me know in the comment section below! "Chrome Nails. Because Why Would You Not?" Great article! Loved to read about how my niece, Mags trip went. Thank you!! Try Costa Rica next to zip line and rappel down waterfalls!